A very early morning run to start the day. The hedges and high stone walls come right to the roads’ edge in many places …few places to step off the road at times so fortunately, not a lot of traffic on the Ballygawley area country roads. A full Irish breakfast (yes again!) to start the day as we sat in the dining room overlooking the mountains around Sligo. Making our way to our first show at the libary in the town Ballymote, the skies opened up and rain kept us company for our 30 minute ride. A triple rainbow today but no time for pictures today. We performed in the new library in the centre of town to a small audience of 20 children from the nearby school. We couldn’t leave without being treated to tea time and then after a fond good-bye, headed towards our next show in nearby Tubbercurry where we had another warm welcome with tea time. 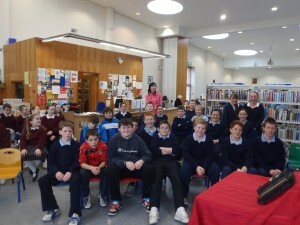 We had 2 classes for this Tubbercurry library show then made our way to Sligo city. En route as we gassed up our car ($100 for 4 days of travel …..yikes!) and spotted a Tim Horton’s sign. Wow! We treated ourselves as after 5 days, we have not yet adapted to instant coffee that is served in most places in Ireland. 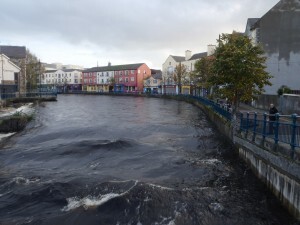 So with our extra zest of ‘high test’, we navigated downtown Sligo. We soon found our sought after destination of the Record Room; a music store where we wanted to buy a spare set of banjo strings and a bodhran for our show and an hour later, we also came out with a wonderful CD of a new young modern trad Irish band, Grada. As we explored the downtown, we found an Irish hat (that fits!) for Arthur and then discovered a tiny shop where a wood carver, Michael Quirke, showed us his beautiful work and told us delightful stories and folklore as he chisled away. Suddenly he stopped, reached for a small square of wood, asked me what my favourite animal was, and proceeded to make me a wood carving picture of a loon swimming beneath an Irish mountain and a sliver moon. After a lovely visit, we exchanged books (he’s a poet too) and said a fond farewell. 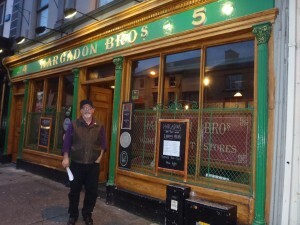 Directed to what’s locally known the best pub food in downtown Sligo, Arthur and I sat down in Hargadon Bros. to a pint and a dinner of bangers and mash and crispy duck on cabbage with blackberries. Amazing! After a dessert of a special recipe of reknowned fresh homemade brown bread and Irish cheeses, we were told that we must come back next September 24 for Ireland’s official ‘Arthur’s Day’. (How can we not with a name like that!) It’s a national celebration in honour of Arthur Guinness. We’ll do our best to return!